Many Victorians were justifiably proud of their country’s achievements, both at home and abroad. Numerous people were art lovers, and there was great pride in our vast manufacturing industries and their world-beating products. 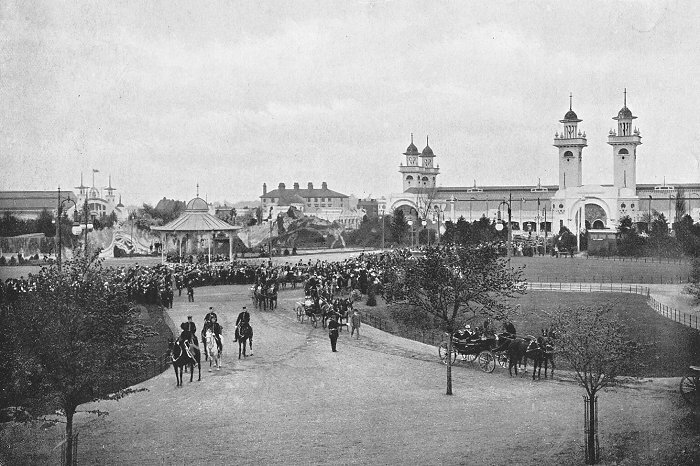 The success of the Great Exhibition at Crystal Palace in 1851 led to many similar exhibitions, on a much smaller scale, taking place throughout the country. Entrepreneurs were always ready to promote such events, which were usually very profitable. 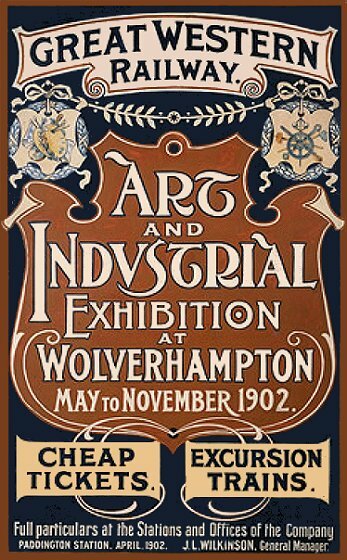 Wolverhampton had its share of exhibitions, most of which were very successful. The first, organised by George Wallis in 1839 was held at the Mechanics’ Institute in Queen Street. 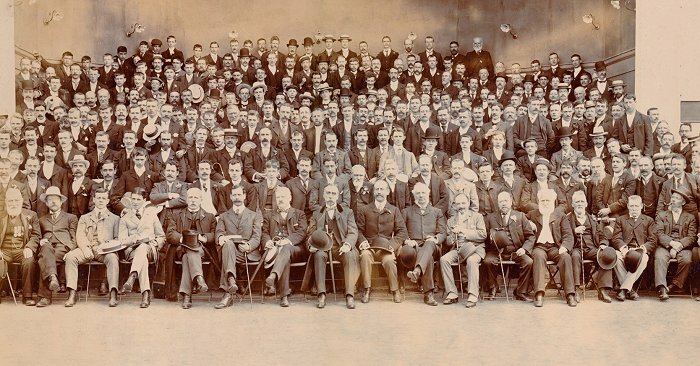 Another held in the grounds of the Molineux Hotel in 1869 was equally successful, as was one in 1884, held in a temporary building on land in Wulfruna Street, where the wholesale market later stood (now the Civic Centre) to raise funds for Wolverhampton Art Gallery, and the School of Art. 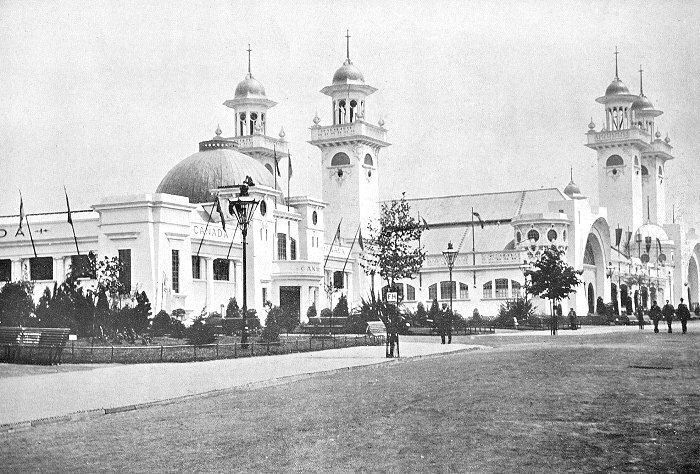 The inspiration for an art and industry exhibition in Wolverhampton possibly came from the 1901 Glasgow International Exhibition upon which much of it seems to have been based. 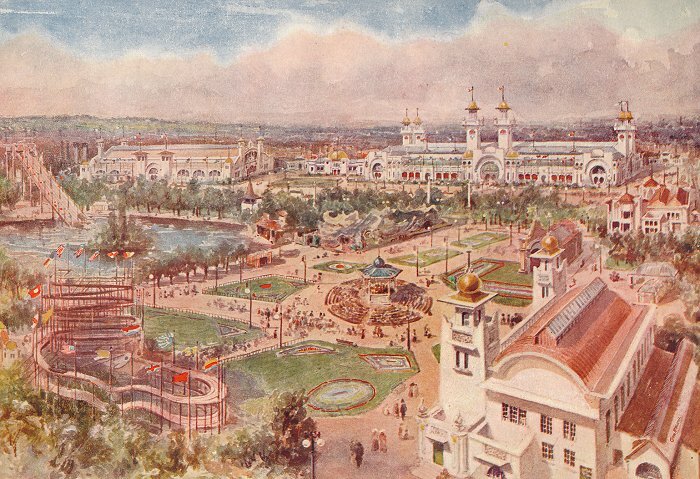 The Glasgow exhibition had displays of fine art in the City’s new art gallery, a highly ornamented industrial hall for industrial exhibits, exhibitions featuring countries with close ties to Glasgow, and entertainment, including a switchback railway, and a water chute. It was extremely successful, attracting around 11.5 million visitors. Much of the inspiration for the Wolverhampton exhibition came from Dunfermline born Thomas Graham, proprietor of the Express & Star newspaper, and prominent Liberal councillor. Interest was shown by local industrialists, businessmen, and the town council. There were many people willing to finance the project, which was seen as a sure way of making money. 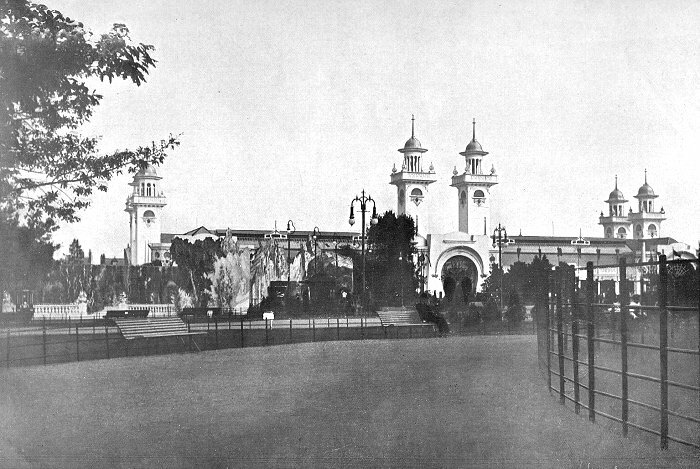 It was to consist of an art display in Wolverhampton art gallery, and industrial displays and entertainment on land near to Newhampton Road East, and in West Park, to allow easy access from the town centre. A bird's eye view of the exhibition by George Phoenix. From Hildreth & Chambers souvenir of the exhibition. 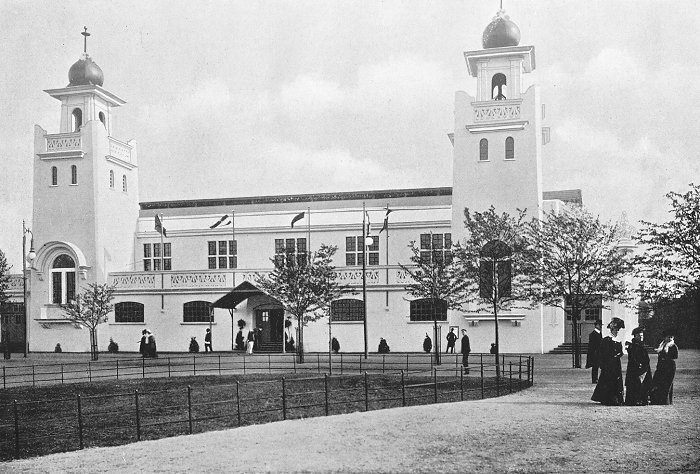 Building work on the large impressive buildings started in 1901, after a competition was held for the design. 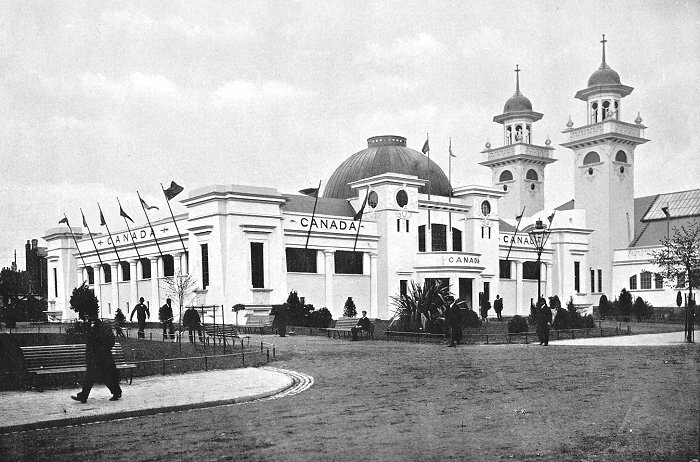 The winners were two Glasgow architects, Robert Walker and Thomas Ramsey, who designed the three main buildings; the Industrial Hall, the Machinery Hall, and the Canadian Hall. The largest building, the Industrial Hall was 107 metres long by 52 metres wide with three bays for displays by British manufacturers. The slightly smaller Machine Hall measured 107 metres long by 40 metres wide. It also had three bays. 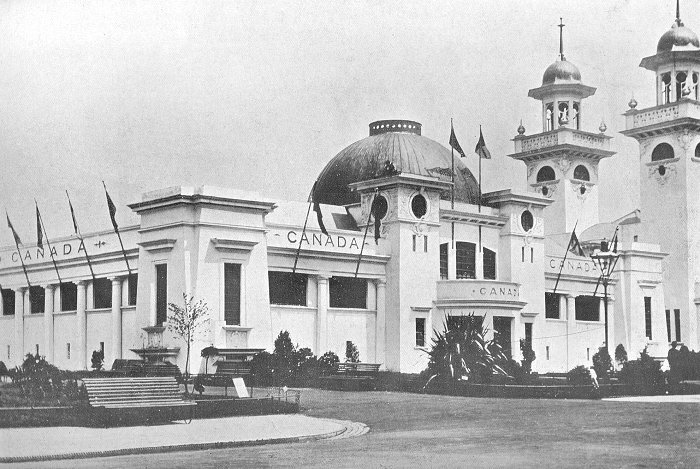 The smallest of the three buildings, the Canadian Hall, was paid for by the Canadian Government and featured attractive displays about the country, hopefully encouraging would-be immigrants from the UK. 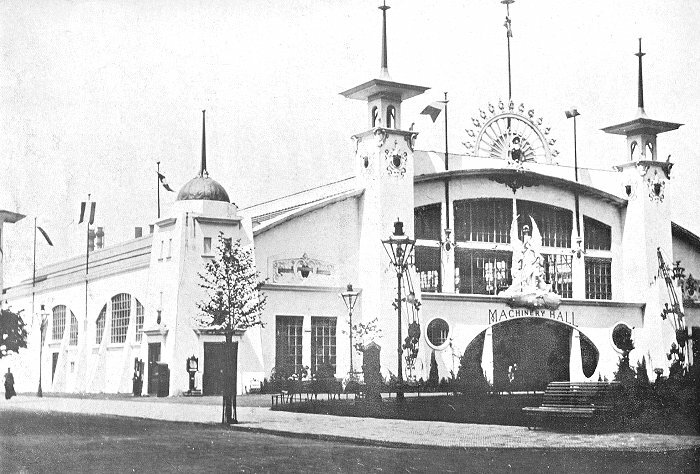 The two other major buildings were the Concert Hall, and the Connaught Restaurant and Shell Bandstand. The building contractors were James Herbert of Hartley Street, and Henry Gough of Dudley Road. Smaller buildings included the Barnard Popular Restaurant, several small restaurants and tea rooms, and a number of small structures built to house displays by local companies. Amusements included the small kiosk bandstand, the water chute, the spiral toboggan, the voyage through fairyland, and magic mirrors. 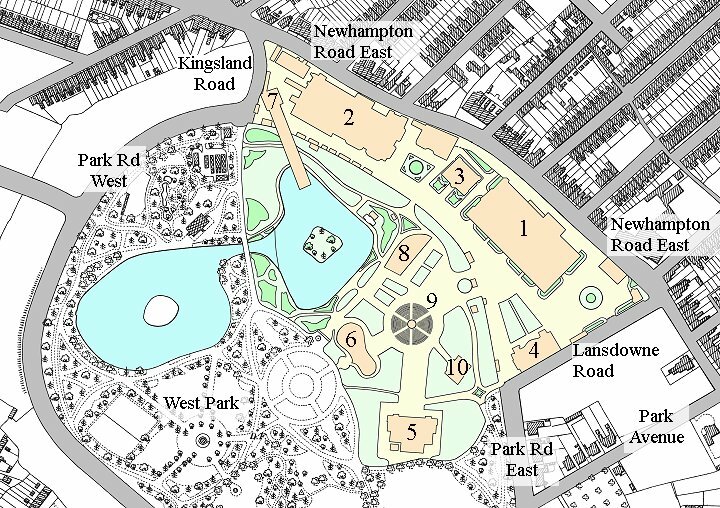 The buildings occupied the north eastern corner of West Park and an area between Park Road East and Newhampton Road East. A section of Park Road East was closed to make way for the exhibition. Because the local authority expected a very large number of visitors to the exhibition, underground toilets were built in Queen Square, and the council ensured that the new electrically-powered trams would be up and running between Whitmore Reans and the town centre to provide easy access to the site. 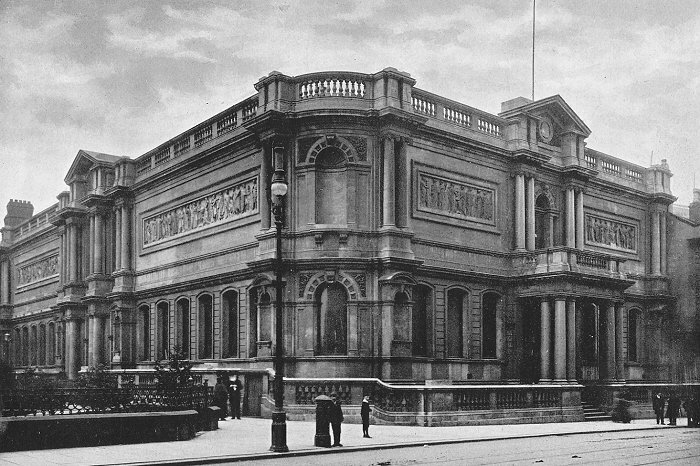 The art displays in Wolverhampton Art Gallery were planned by the Fine Art Committee, under the chairmanship of Laurence Hodson. 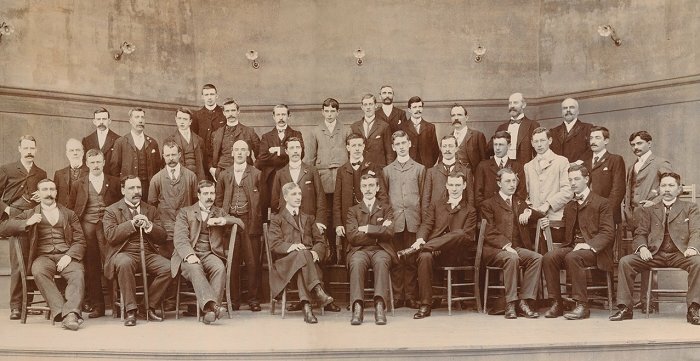 The committee consisted of John Annan, John F. Beckett, Thomas B. 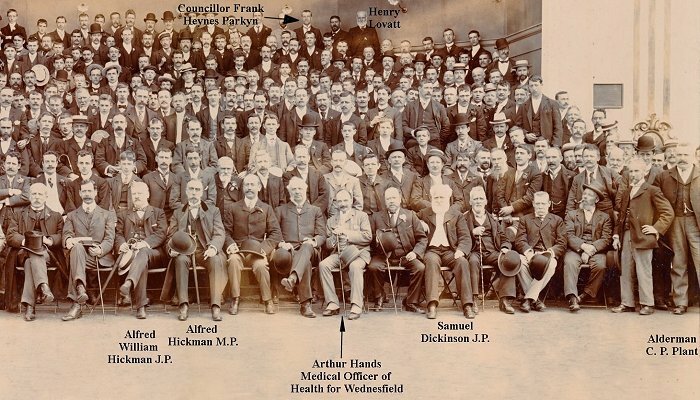 Cope, Edward L. Cullwick, Edward Deansley, A. C. C. Jahn (Director of the art gallery), Charles Paulton Plant, J.P. (mayor of Wolverhampton), H. G. Powell, W. S. Rowland, Thomas H. Sidney, Ernest White, R. Williams, and Thomas Wilson. The paintings and sketches included works by John Constable, Sir Joshua Reynolds, William Hogarth, Thomas Gainsborough, Van Dyck, J. M. W. Turner, James Abbott McNeill Whistler, Horatio McCulloch, William Strang, D. G. Rossetti, Rembrandt, Edward Burne Jones, and many others. 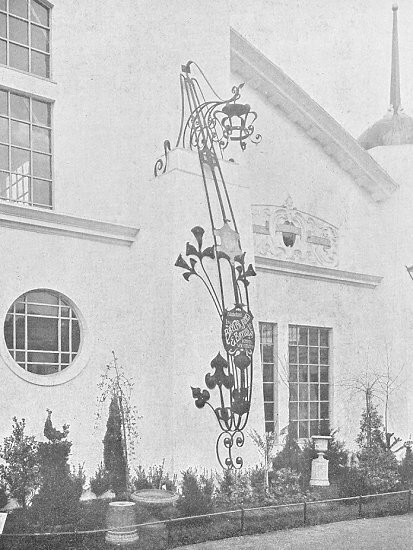 An ornate light fitting on the front of the Machinery Hall. From Hildreth & Chambers souvenir of the exhibition. Many important artworks were on display at the exhibition. Duncan Nimmo has kindly sent the following assessment of the art section, that came from an article about William Strang in the journal “Studio” from 1921. Between 1899 and 1901 Strang painted the ten canvasses with which he established a place for himself amongst the English painters of the day. This series, to be mounted in panelling as a frieze, was dedicated to the theme of Adam and Eve and commissioned by an enlightened collector and patron, the Wolverhampton brewer, Laurence Hodson. It was in this series that Strang first managed to correlate a sympathetic code of colouration with his established ability to compose in the classic and massive manner. Amongst those critics and painters who felt that the decorative and insubstantial aspects of French Impressionism and bravura painting had, via the N.E.A.C., gained too much of a hold over young English artists, such works were welcome. The special stamp that was produced to commemorate the exhibition. Courtesy of Terry Furler. 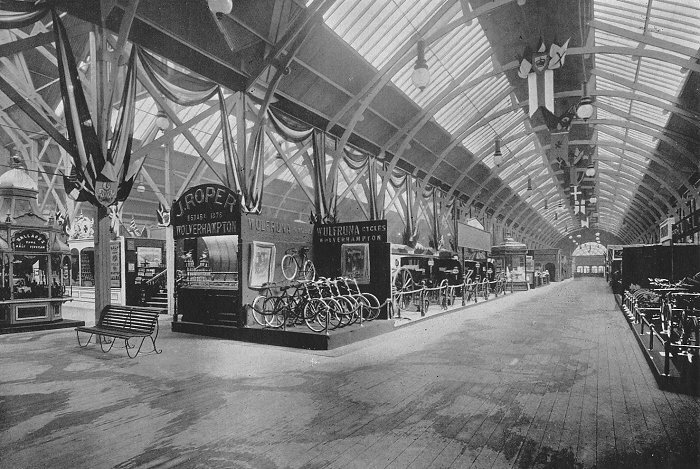 The exhibits in the Industrial Hall consisted of displays by British manufacturers, including ironwork, safes, silverwork, glass, upholstery, paint, bicycles, and even a display by Heinz, featuring soups, baked beans, and tomato sauce, which visitors could sample. Other items on display included cycles by Beau Ideal, and Wulfruna; safes by Chubb, and George Price; locks and door furniture by James Gibbons; fencing and gates by Bayliss, Jones & Bayliss; and gears by John Roper. There were also some exhibits from abroad including carvings from India, and arts and crafts from Japan. Wolverhampton Art Gallery where the fine art section was on display. 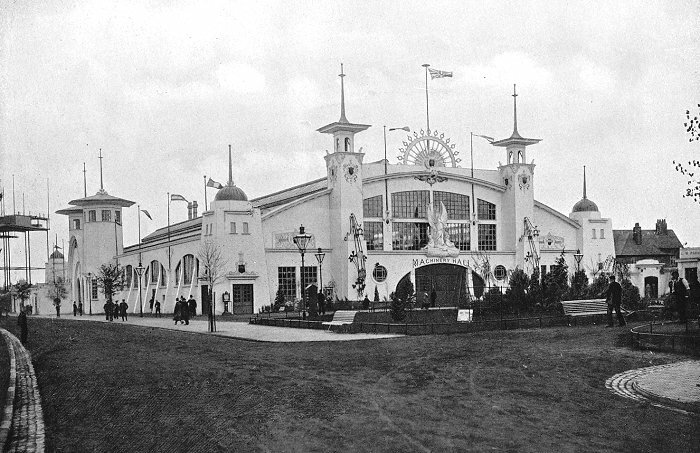 From H. J. Whitlock & Sons photographic souvenir of the exhibition. 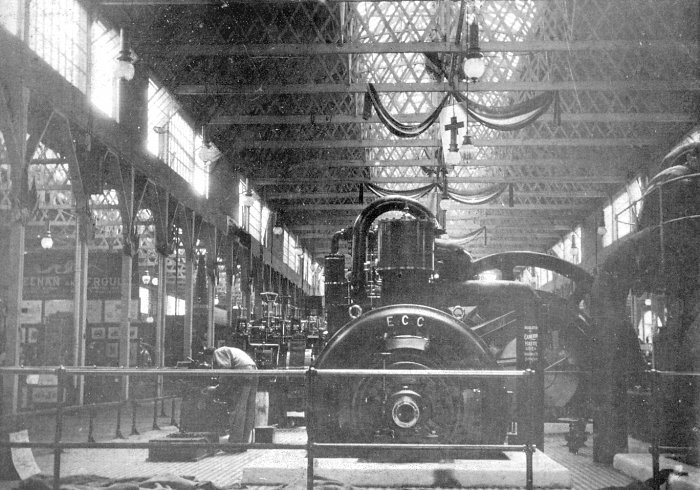 In the Machinery Hall visitors could see impressive displays of a wide range of machinery, including motors, printing machines, weaving machines, and the boilers and generators that were supplying the electricity for the exhibition. 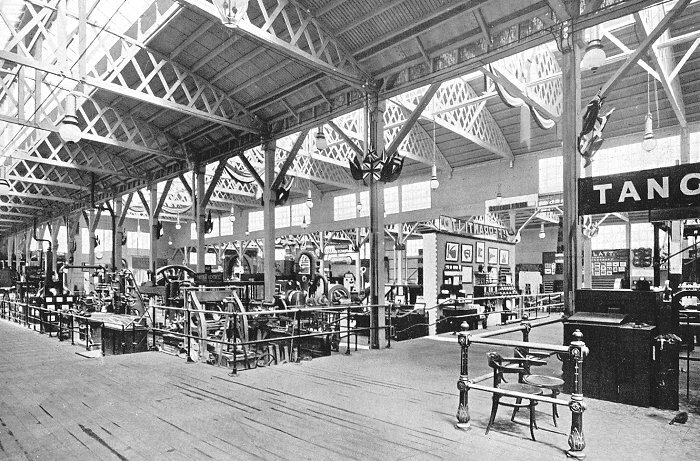 Displays included electric motors and generators by E.C.C. ; boilers by John Thompson; and pumps by Joseph Evans. In the Canadian Hall were displays featuring the country’s natural resources, including minerals, gold ore, clay, timber, and agricultural goods such as meat, fruit, whisky, butter, cheese, eggs, grain, grasses, and canned goods. There were also displays of photographs, and landscape paintings. Entertainment in the Concert Hall included orchestral concerts, recitals, and even a ping-pong tournament. 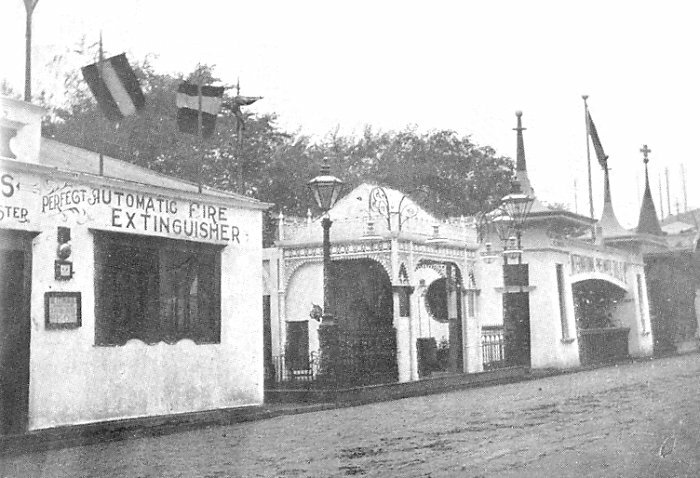 Outdoor entertainment included the five storey spiral toboggan, the first of its kind in the country; the water chute, the first one in the Midlands; the kiosk bandstand, and a small fire station. There was also the voyage through fairyland; and the magic mirror building with its ‘hall of laughter’ with twenty five mirrors. 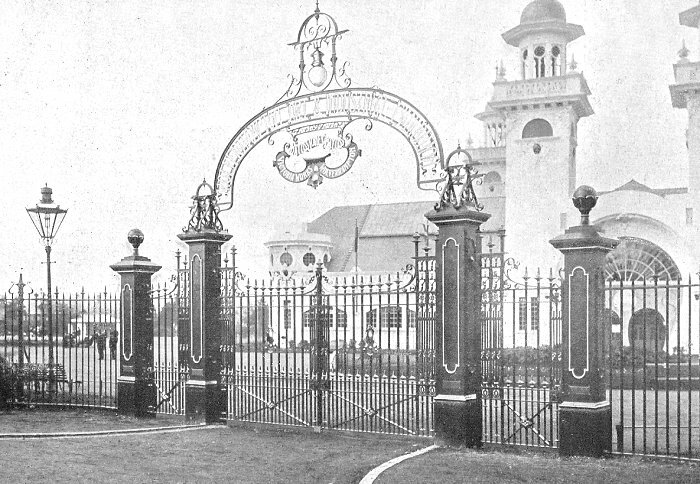 The fine wrought iron railings and gates at the main entrance in Lansdowne Road. They were manufactured by Bayliss, Jones & Bayliss Limited. From Hildreth & Chambers souvenir of the exhibition. 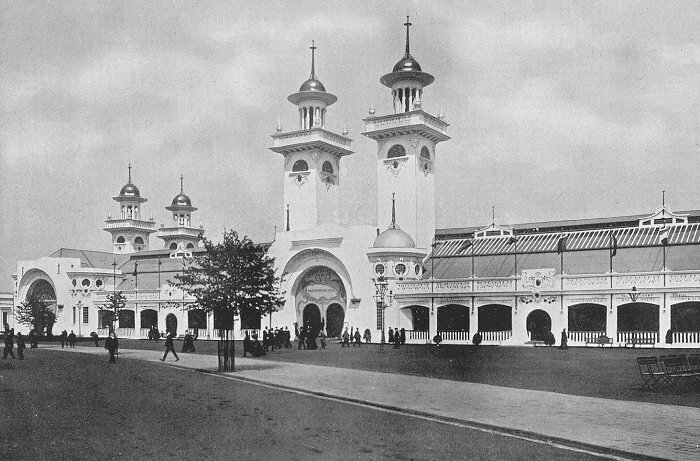 The exhibition opened on 1st May, 1902. The president was the Earl of Dartmouth. The official opening was carried out by the King’s brother, the Duke of Connaught, who arrived at the High Level Station on a special train along with a party of guests including the Duchess of Connaught, and the mayor of London and his sheriffs. They travelled to the exhibition after a brief stop at Wolverhampton Art Gallery where they were greeted by the mayor of Wolverhampton, Councillor Charles Paulton Plant, before inspecting the fine art exhibits. 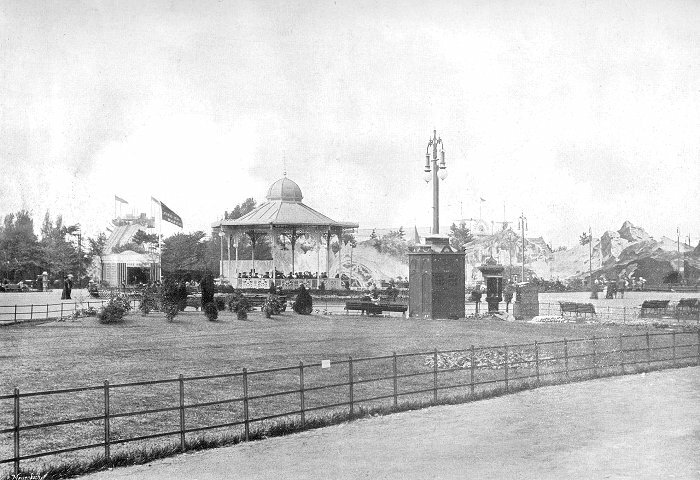 The carriage then made its way to the industrial part of the exhibition via Queen Square, where the new toilets were covered in red cloth to hide them from the royal party’s view. They then proceeded via Darlington Street, Waterloo Road, and Newhampton Road East. 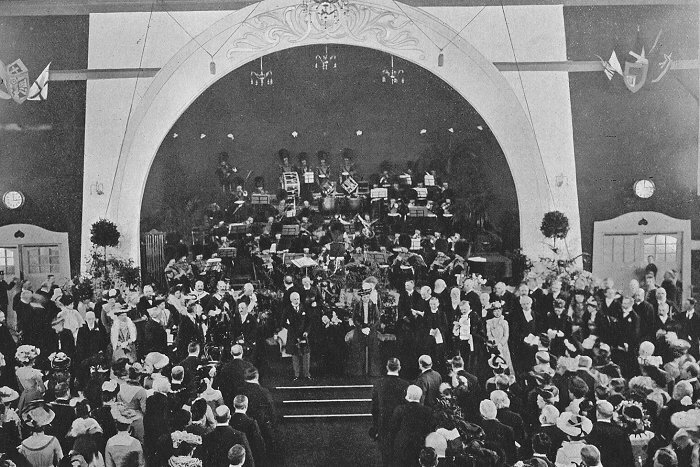 They arrived at the exhibition and were welcomed in the Concert Hall where speeches were given, and the exhibition was declared open. At three o’clock they arrived at the Industrial Hall where a gold key was handed to his highness, who proceeded to unlock the front door. After viewing the hall, the party visited the Canadian Hall where they were received by Lord Strathcona, followed by an inspection of the Machinery Hall, and a walk around the site. Around four o’clock they entered the refreshment rooms for a rest before returning to the railway station to catch their train. That evening there were illuminations in the town and at the exhibition. The arrival of the Duke & Duchess of Connaught. From H. J. Whitlock & Sons photographic souvenir of the exhibition. 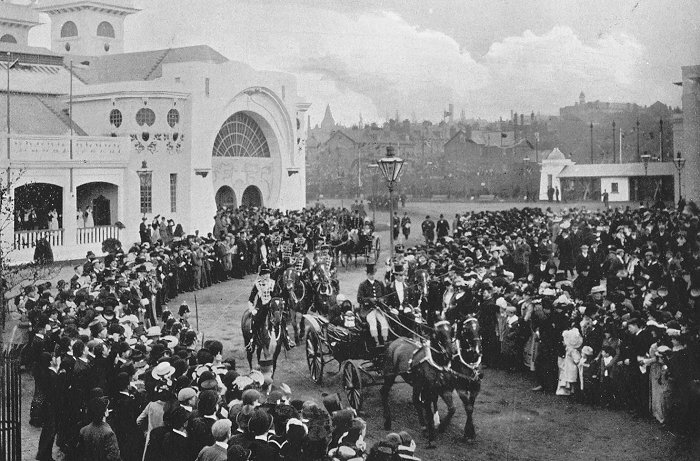 The arrival of the Duke & Duchess of Connaught at the Concert Hall. From H. J. Whitlock & Sons photographic souvenir of the exhibition. The opening ceremony. From H. J. Whitlock & Sons photographic souvenir of the exhibition. One local celebrity who visited the exhibition was Colonel Tom Thorneycroft, the eccentric owner of Tettenhall Towers. On seeing the great water chute, he couldn’t resist having a go. The 81 year old was greatly shaken by the buffeting during the descent, so much so that he became ill. Sadly he never recovered, and died on 6th February, 1903. 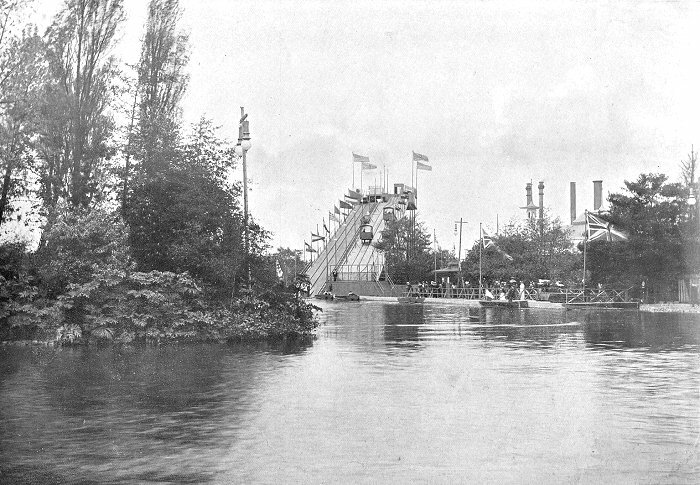 The water chute. 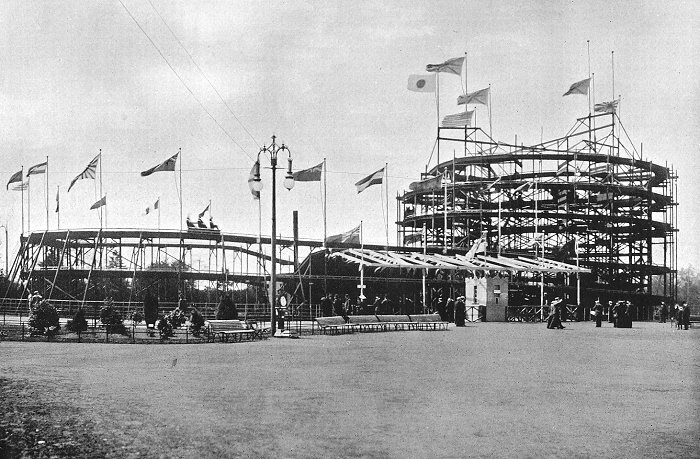 From H. J. Whitlock & Sons photographic souvenir of the exhibition. 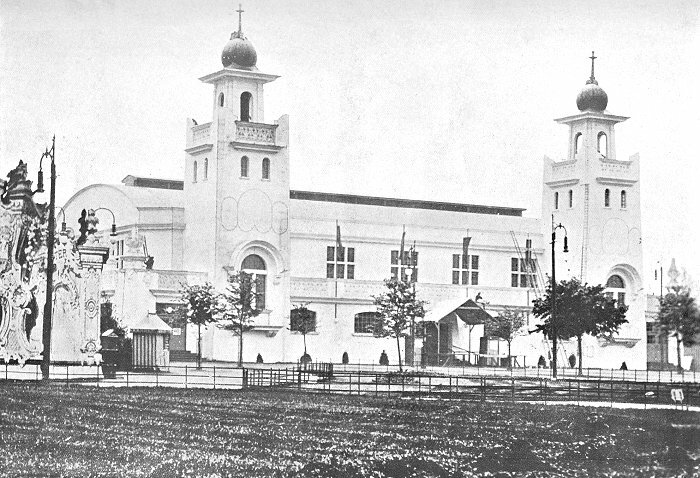 The exhibition, although Wolverhampton’s grandest display, failed to attract the expected number of visitors. One factor must have been the poor summer, which was cool and unsettled. That year there were three major volcanic eruptions, one at Martinique, another at Guatemala, and a third in Mexico, which reduced the solar radiation between 10 and 20 percent. Rail travel was also quite expensive, so many people would have been reluctant to travel a great distance to the event. Although 245,000 people attended on the first day, and around 1.5 million attended over a period of six months, the exhibition made a loss of £30,000 which equates to over £3 million in today’s money. By November the subscribers had had enough. The exhibition closed on 8th November, even though there were calls to reopen it in the following year. It was a sad end to such a prestigious and ambitious event, which initially attracted so much interest. During the next few months everything was sold at auction. Thomas J. Barnett & Sons, auctioneers, produced a catalogue listing everything from the buildings to their contents. 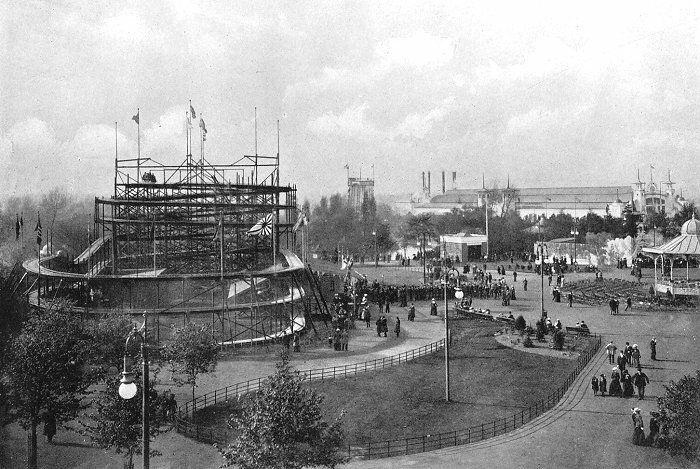 By the end of 1903 the site must have looked much the way it did before the exhibition was planned. One of the sale items became the once well-known Swiss chalet bus shelter in Wergs Road, Tettenhall, which was eventually replaced by a modern structure. The Industrial Hall. From Hildreth & Chambers souvenir of the exhibition. Another view of the Industrial Hall. From H. J. Whitlock & Sons photographic souvenir of the exhibition. The interior of the Industrial Hall. From H. J. Whitlock & Sons photographic souvenir of the exhibition. Another view of the interior of the Industrial Hall. From Hildreth & Chambers souvenir of the exhibition. 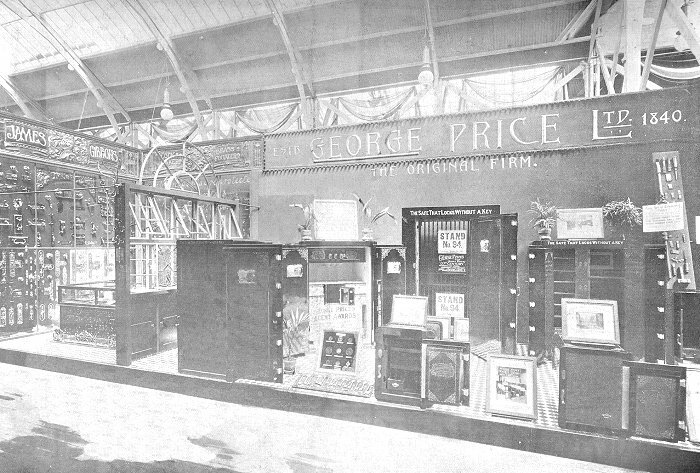 The George Price display of safes in the Industrial Hall. From Hildreth & Chambers souvenir of the exhibition. 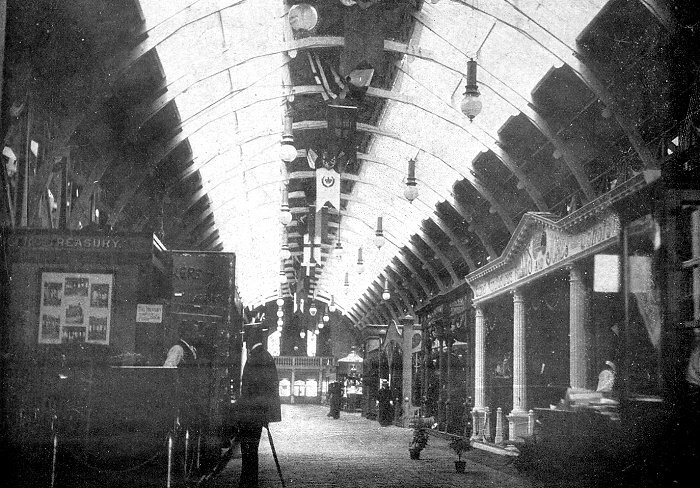 A final view of the interior of the Industrial Hall. From Hildreth & Chambers souvenir of the exhibition. The Machinery Hall. From Hildreth & Chambers souvenir of the exhibition. Another view of the Machinery Hall. From H. J. Whitlock & Sons photographic souvenir of the exhibition. 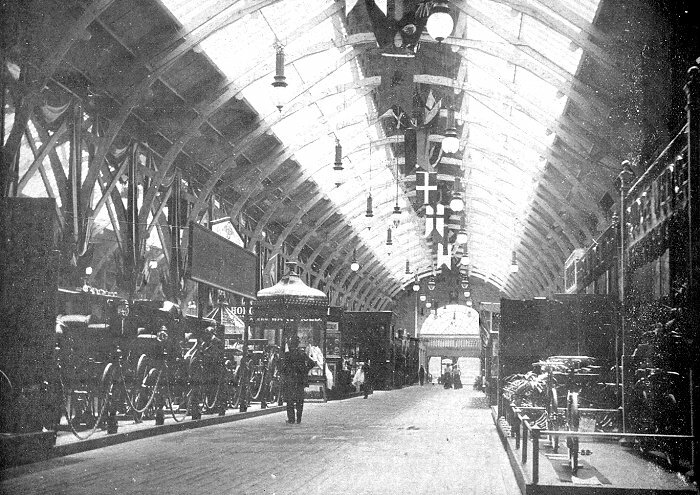 The interior of the Machinery Hall. From H. J. Whitlock & Sons photographic souvenir of the exhibition. Another view of the interior of the Machinery Hall. From Hildreth & Chambers souvenir of the exhibition. 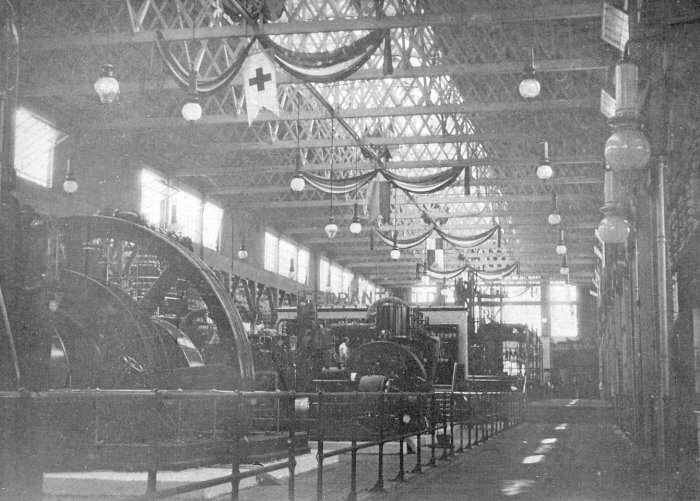 A final view of the interior of the Machinery Hall. From Hildreth & Chambers souvenir of the exhibition. 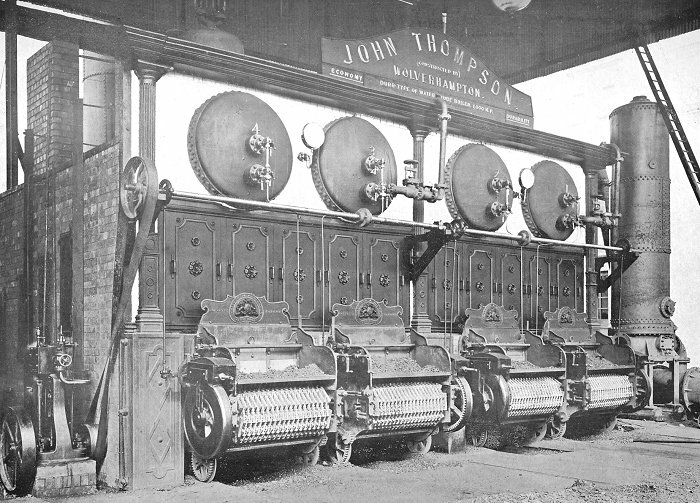 The John Thompson boilers in the Boiler House. From Hildreth & Chambers souvenir of the exhibition. The Canadian Hall. From H. J. Whitlock & Sons photographic souvenir of the exhibition. Another view of the Canadian Hall. From Hildreth & Chambers souvenir of the exhibition. The Concert Hall. From Hildreth & Chambers souvenir of the exhibition. Another view of the Concert Hall. 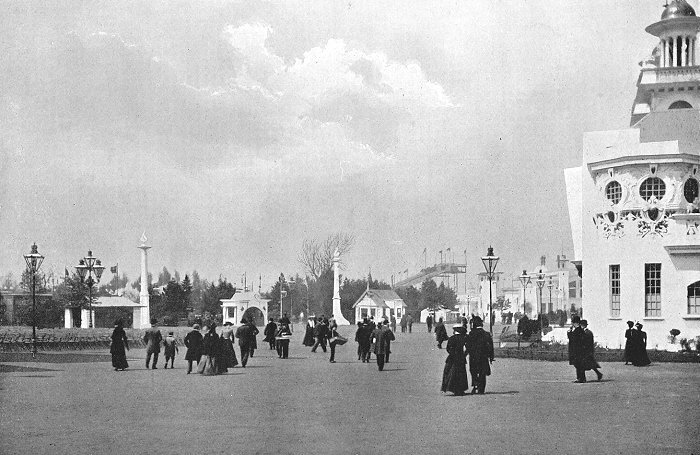 From H. J. Whitlock & Sons photographic souvenir of the exhibition. 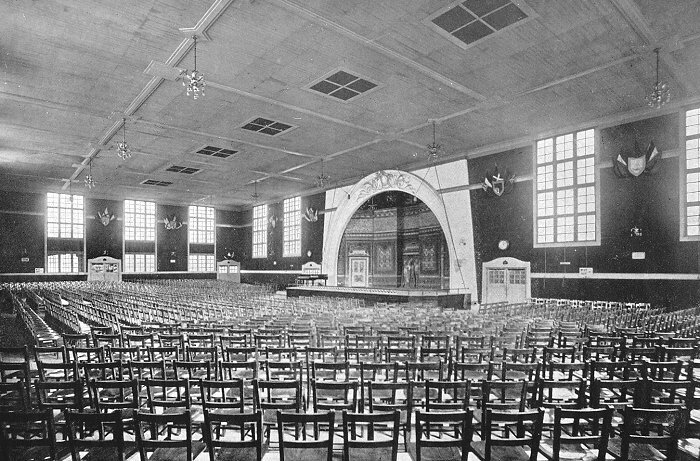 The interior of the Concert Hall. From H. J. Whitlock & Sons photographic souvenir of the exhibition. 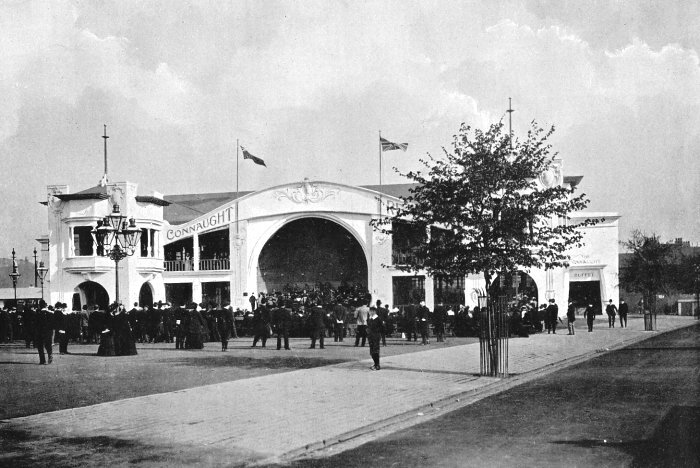 The Shell Bandstand and Connaught Restaurant. From Hildreth & Chambers souvenir of the exhibition. 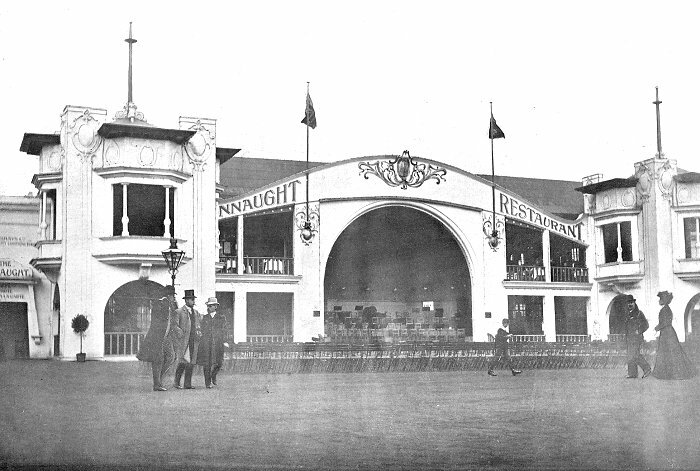 Another view of the Shell Bandstand and Connaught Restaurant. From H. J. Whitlock & Sons photographic souvenir of the exhibition. 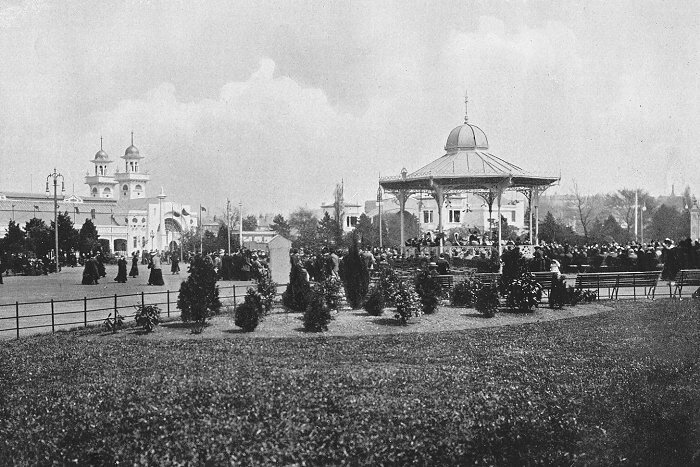 This is another photo of the Shell Bandstand that was also taken by H. J. Whitlock & Sons. It appears to show people who were involved in the exhibition, possibly some of the traders, sponsors, businessmen and local dignitaries. I must thank David Clare for kindly sending a copy and allowing it to be included here. A slightly larger view of part of the above photo. Courtesy of David Clare. A final view of the photo, to which I have added a few names. Courtesy of David Clare. Another of David Clare's wonderful photos from the exhibition. This one has 'Stall staff at the 1902 exhibition' written on the back. 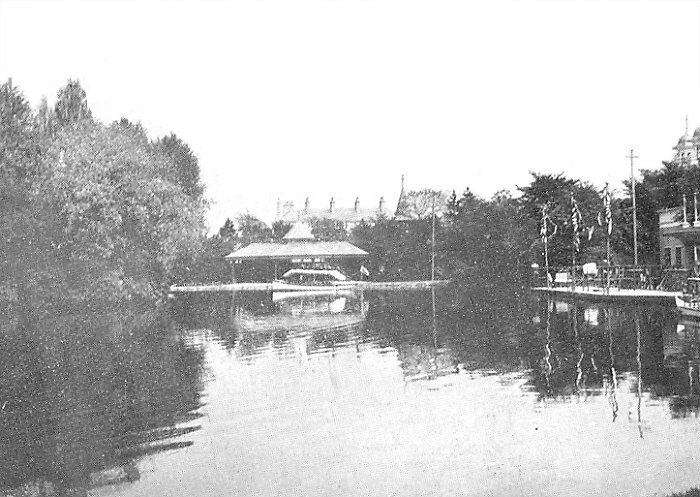 It was also taken by H. J. Whitlock & Sons in the Shell Bandstand. On the previous photo, the group was too large to fit on the stage, so some people were standing on the stage and others were standing and sitting in front of the stage, which was obscured. 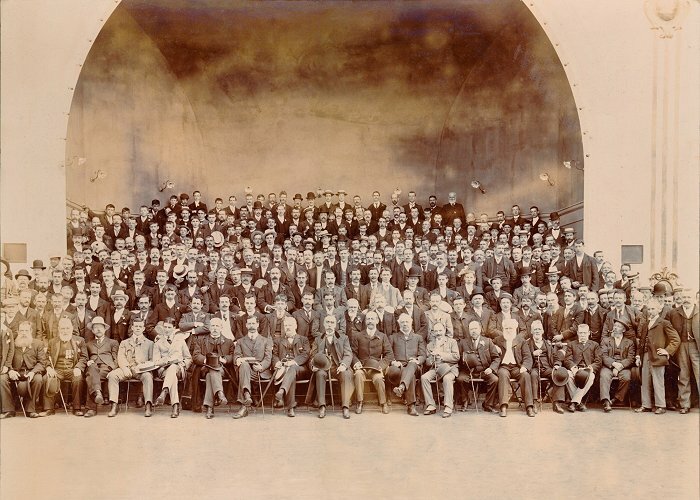 In this photo, the much smaller group of people are standing and sitting on the stage itself. The Connaught Restaurant. From Hildreth & Chambers souvenir of the exhibition. 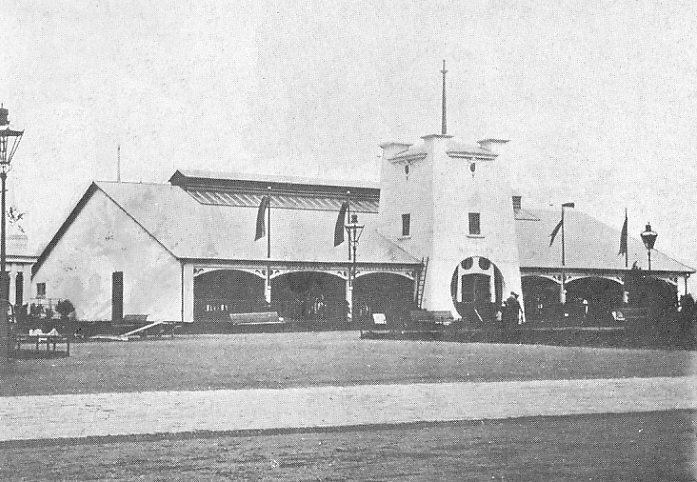 Looking towards the Machinery Hall with the Industrial Hall on the right. From Hildreth & Chambers souvenir of the exhibition. 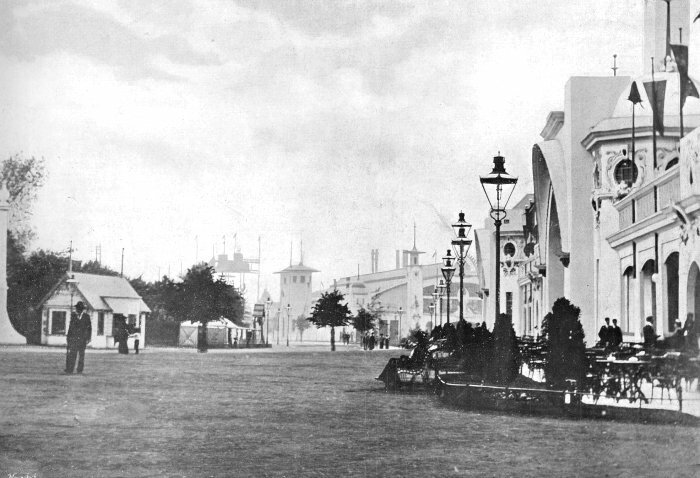 Looking eastwards towards the Shell Bandstand and Connaught Restaurant. On the left is the Canadian Hall with the Industrial Hall behind. 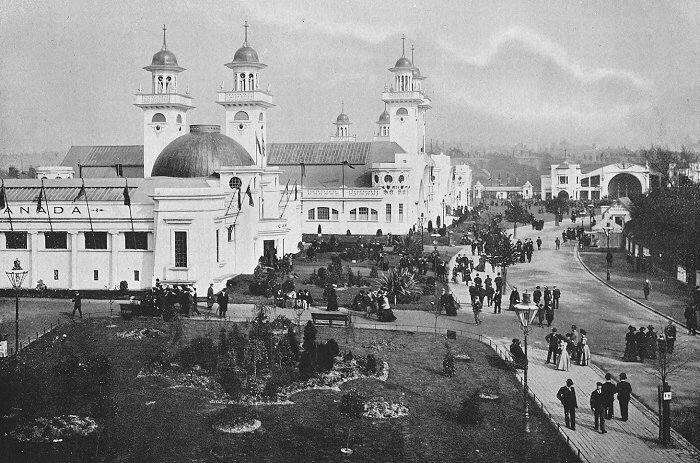 From H. J. Whitlock & Sons photographic souvenir of the exhibition. A hand-coloured version of the previous image. 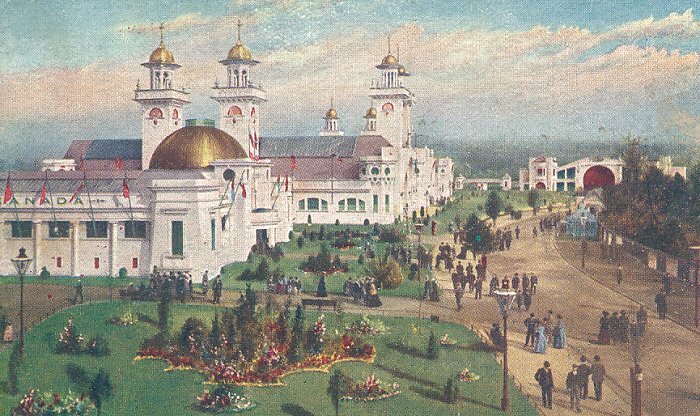 From an old postcard. 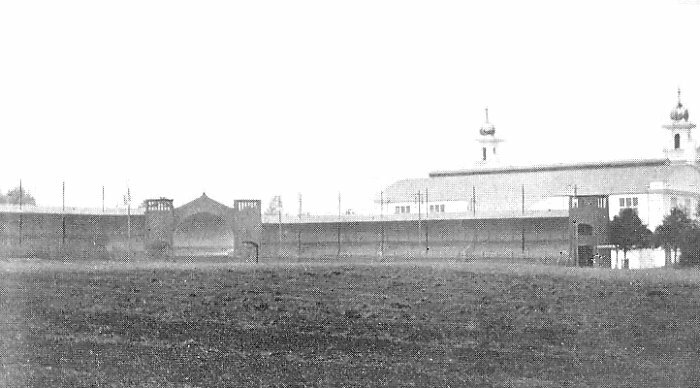 Another view looking east with the Canadian Hall on the left and the Industrial Hall on the right. From Hildreth & Chambers souvenir of the exhibition. Looking westwards towards the Water Chute from near the main entrance. From H. J. Whitlock & Sons photographic souvenir of the exhibition. The Industrial Hall from West Park. From Hildreth & Chambers souvenir of the exhibition. The Barnard Popular Restaurant. From Hildreth & Chambers souvenir of the exhibition. 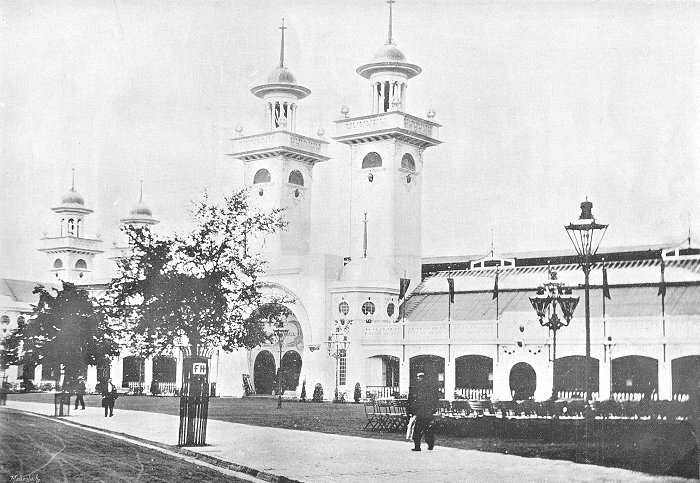 The Kiosk Bandstand with the Industrial Hall on the left. From H. J. Whitlock & Sons photographic souvenir of the exhibition. 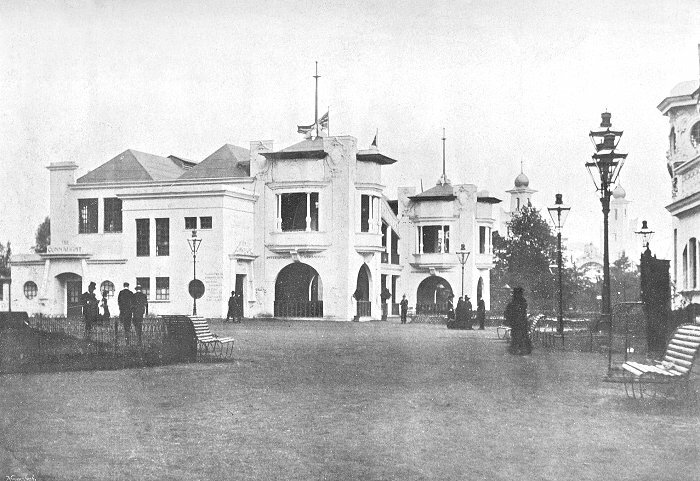 The Kiosk Bandstand with the Fire Station to the left, and the Voyage Through Fairyland on the right. From Hildreth & Chambers souvenir of the exhibition. The Spiral Toboggan. From H. J. Whitlock & Sons photographic souvenir of the exhibition. 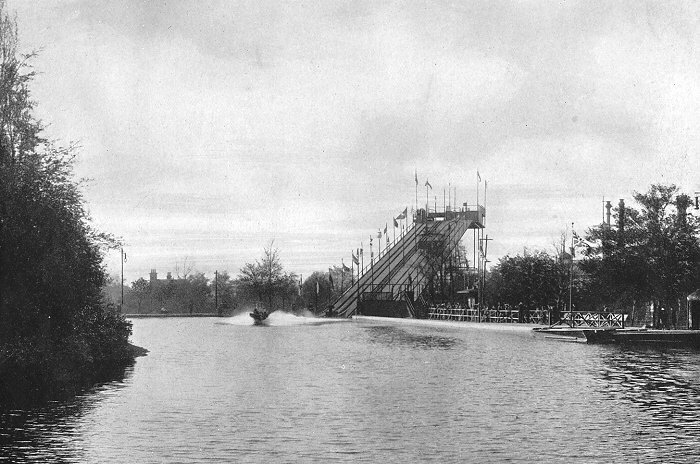 Another view of the Spiral Toboggan. From Hildreth & Chambers souvenir of the exhibition. 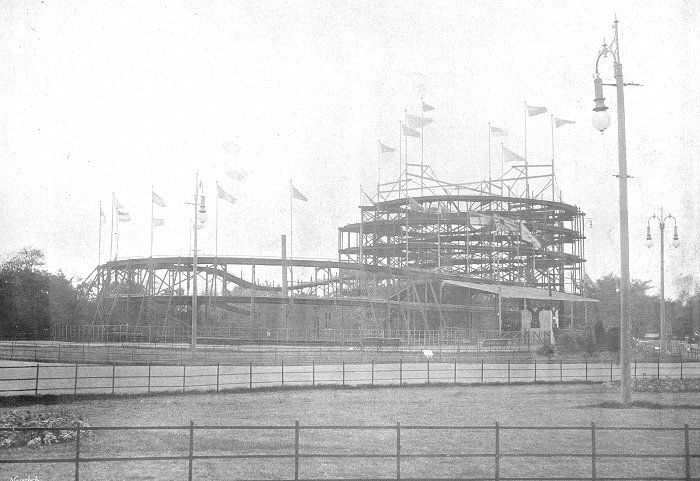 A final view of the Spiral Toboggan with the Water Chute behind, and the Machinery Hall in the distance on the right. From H. J. Whitlock & Sons photographic souvenir of the exhibition. The Water Chute. From Hildreth & Chambers souvenir of the exhibition. 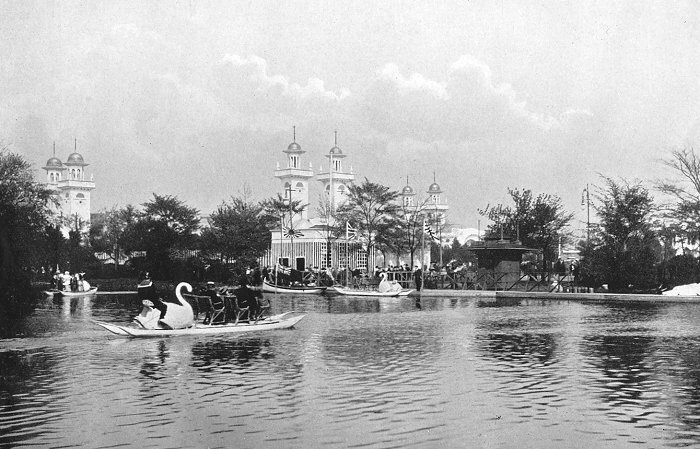 Swan boats on the lake. From H. J. Whitlock & Sons photographic souvenir of the exhibition. An electric launch on the lake. From Hildreth & Chambers souvenir of the exhibition. Some of the outside exhibits. From Hildreth & Chambers souvenir of the exhibition. The Tournament and Firework Ground. From Hildreth & Chambers souvenir of the exhibition.